Perfect handbag dear!! Really nice! 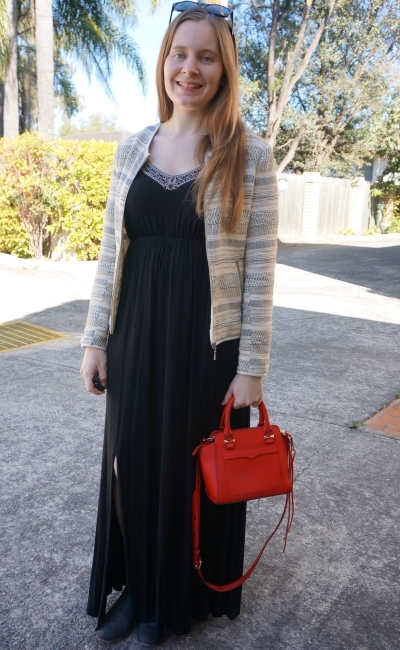 Love how you styled the dress with the pop of red bag! Have a great week dear. Thank you! 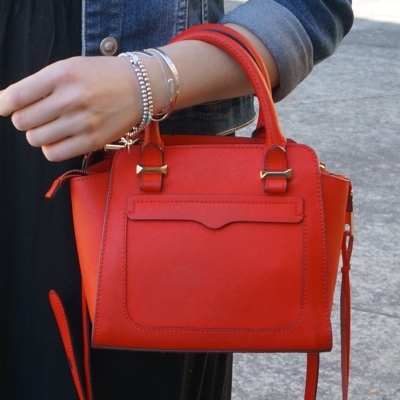 I love accessorising with red, such a fun pop of colour! I am so jealous you can sew a maxi dress, you're so talented! maybe next summer! Sounds like it was a great weekend. You can never go wrong with a black maxi dress. I saw that last photo on IG and love how you cover you sons face with a sticker. That stinks that people are putting needles in the strawberry. Seems like no food is safe anymore. haha yes it's so hard getting a photo without their faces in it, I had to cover it up as it was the best of a crazy bunch with them running around. Much easier taking pics before we go out! Oh both of these black maxi dresses are fantastic! That was something I wanted to add to my closet over the spring/summer but never found the right one. LOVE it with the denim jacket and red bag! So horrible this strawberry incident! I know you are a cautious mother and therefore I'm not in sorrow when you with your boy ins the strawberry field. Like both of the looks, you know, I think maxi suits you perfectly! Thanks Rena. It's shocking how far this incident has spread! I love the pop of color with that purse, Mica!! It goes to show how it works with so much!! And you have 2 black maxis??? I need to get shopping I guess...LOL!! haha yes! I struggled so much with buying another one when I already had one, but I ended up loving them both too much to part with either! Yay for spring! I love your black maxi with the denim jacket and red bag, and it seems like it would be a perfect combo for me to try for fall here! That bag is so cute! I love how bright it is! And how funny that you unintentionally matched your location! I love using denim jackets to add a more casual feel to my dressier pieces. I think it made for a great fit with the dress and I love the bag paired with it, too! It is horrible seeing how far reaching the tampering is! I hope it's over soon, I'm worried they still haven't found who is responsible! You look lovely in both outfits - they're nice simple looks. The addition of the jean jacket definitely takes the LBD (long black dress!) down a notch style-wise (I mean in that it makes them more casual). Love the sweet little red bag. Why would anyone do that to strawberries?? What is up with people! Thanks Sheila :) I love the denim jacket and maxi dress combo. It is so wrong, I can't believe it's spreading across Australia. I hope they catch whoever has been doing it and find out why! What a lovely bag. I love the classic and timeless style. And the pop of red is really pretty. Oh I do love black dresses! Fabulous look Mica! hehe thank you! I've been wearing my hair like this a lot! It looks like you have been having a lot of fun with your family! I love going strawberry picking each spring! I typically make freezer jam and we enjoy it throughout the year. Your jacquard jacket looks really nice with that maxi dress. It compliments the embellishments so well! Hope you have a nice rest of your week! That's a great idea! After making a couple of smoothies we ended up eating all the strawberries - my boys love them! I love both these maxi dress - and the first set of photos really reinforces for me that I need to get a good denim jacket into my closet ASAP! I think it's a real classic, although I haven't had much luck finding one to replace this one! Such a lovely day- and yay for denim jackets! I always break mine out for the first time in the spring and wear it straight through the fall! They are great for spring and autumn, but can't really wear it much in summer here! A strawberry crime wave?! What is this world coming to? That sounds like a soap opera storyline for sure! You look great in that maxi dress! I never would have thought to pair a maxi with boots! Yes! It's so crazy - and has spread so far! So frustrating and disappointing. I bought a zebra print maxi dress and it is incredibly versatile as well, something I´d never thought it could be due to the print. Aww, I love that you had a red bag to go strawberry picking, even if the matching wasn't intentional :) I love the versatility of a black maxi dress too, you can't go wrong with that. I've never taken my kids berry picking before, I really need to do that! Dying over that cure red bag! The maxi dress is so versatile and chic too. I love me a classic black dress! I love the red mini bag. 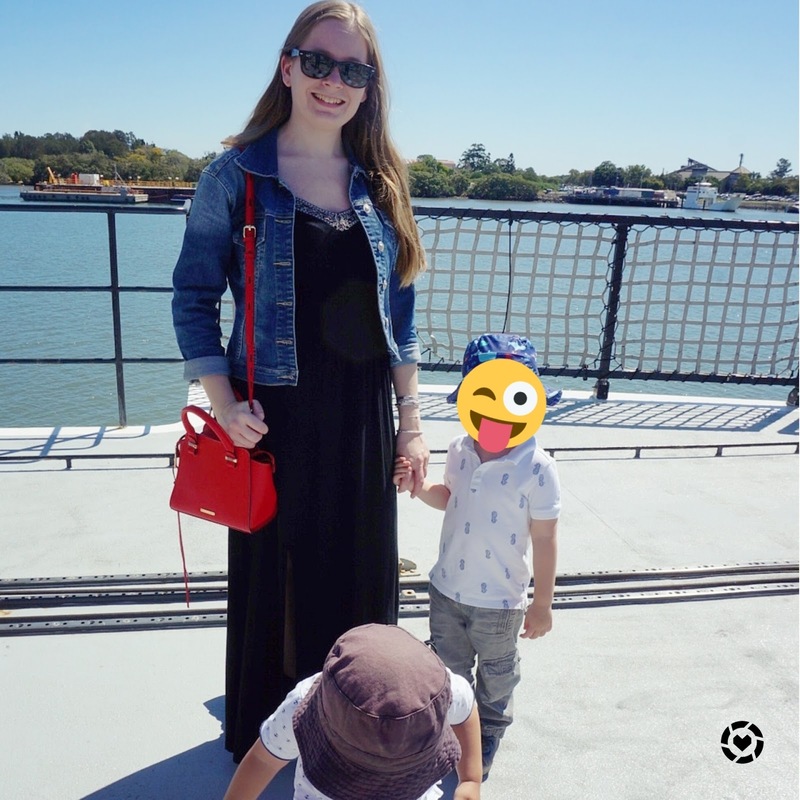 In love with your red bag, amazing looks too! The red bag really pop against the backdrop the of the dress! haha yes, it's the perfect temps right now for both of us to wear it before the temperature changes too much! 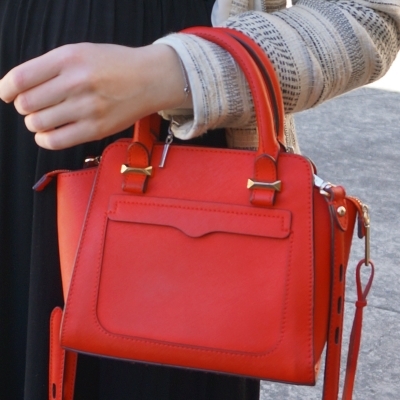 The Bold color of the bag can give something extra to any outfit.Cute outfit! That is such a really cute bag, I love red bags and this one is so pretty. I like how you went to a strawberry farm, that must be so much fun. I also really wash well and chop the strawberries before I give it to my boys these days. Wishing you a fun and warm weekend. It is silly that we have to be so vigilant, but I hope that they can catch the people responsible! Hi Mica! Happy spring:) You look amazing as always! I adore the dash of red in both looks. 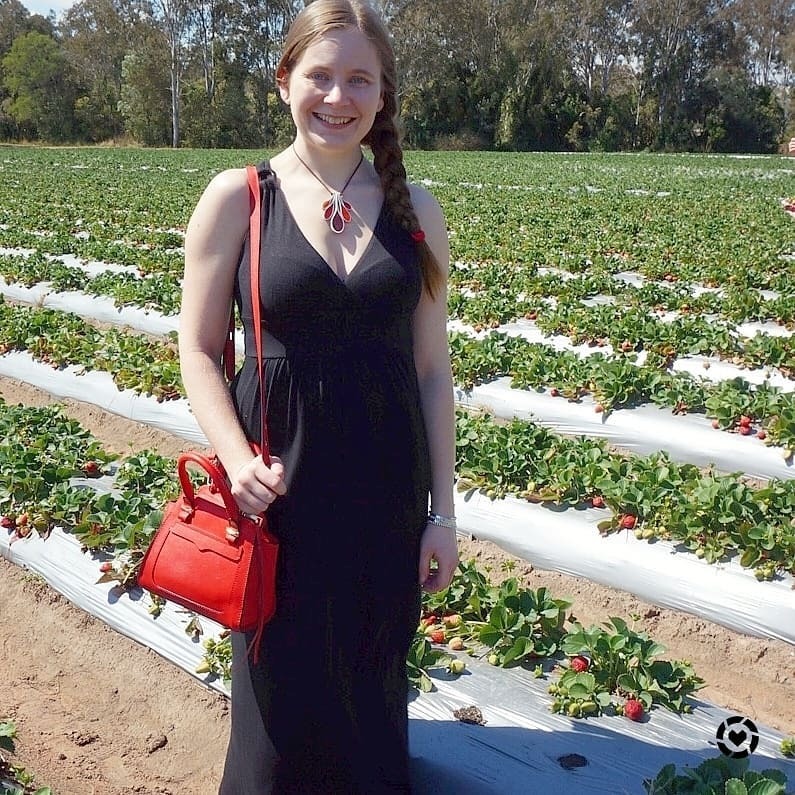 A red bag is so perfect for all seasons and you styled it beautifully! I pray you and your family have a fun weekend! I need to try a side braid sometime soon! I just love this black maxi dress, it looks so comfy and the bright bag really adds a nice pop of color! Oh that bag is too cute and big for a mini. And the denim jacket looks great with the dress and does dress it just enough. Could you imagine if you wore a fur stole-hahaha just kidding. You look great. haha yes that would definitely be overdressed! 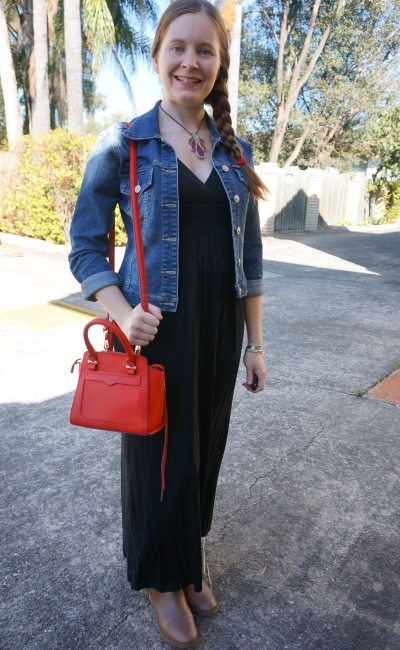 I love that red bag with your denim jacket and maxi! So cute! I really like wearing my denim jacket too. Hope you can make the most of your denim jacket before the weather changes! I never would have guessed that was a mini bag because it looks pretty large. I love how it looks with your outfit!